Published in Perspectives, the ASA Theory section newsletter, 27(4 ):15, 2004. Also available in pdf format. Please cite as: Deflem, Mathieu. 2004. 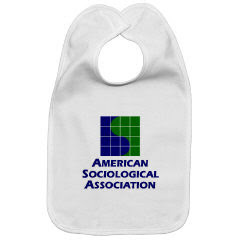 “Large Mug, Mousepad, Infant Creeper, Bib, Dog T-Shirt: The Professional Group Revisited.” Perspectives, the ASA Theory section newsletter, 27(4):15. The ASA website has recently begun advertising an ‘online store’ where members can purchase merchandise with the ASA’s traditional or centennial logos (http://www.cafepress.com/asoca). According to a September 2004 email from the ASA executive office, the online store “allows ASA to offer multiple promotional items (primarily clothing) with no upfront expense beyond a small hosting fee. These items are of very high quality, and make great rewards and gifts for students and colleagues.” I beg to differ a lot and theorize a little. 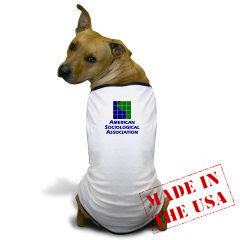 The ASA online store contains such items as t-shirts, tote bags, baseball caps, mousepads, infant creepers, bibs, and dog t-shirts, all embroidered with the ASA logos. Perhaps the ASA administration sees the store as a way to raise money for the Association. But there are many different ways to raise money, and alternatives might have far fewer unintended consequences. For instance, the ASA administration could have found more appropriate ventures, such as a book sale or a new series of publications (e.g., textbooks with papers drawn from ASA journals). I hear that books make great gifts for students. The ASA might even decide to increase the membership dues should additional revenue be needed. If we are members of the ASA, and the Association’s work costs money, then we ought to be good citizens about it and pay for what we want. But what is the message that is sent by having an online store with silly and offensive merchandise? 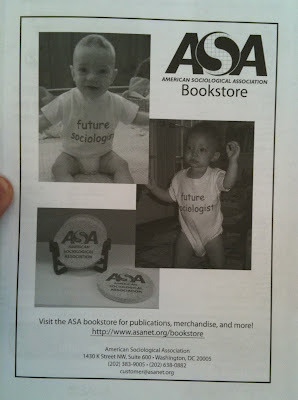 Does it suggest that ASA members do not want to give money to the ASA unless they get a t-shirt or a bib in return? Is that really so? Or will that be so once we let this commercialization go on? And if so, does the ASA contribute to make ASA members consumers rather than intellectuals? The broader issue that is involved in this matter is indeed, as Durkheim reminded us, not an economic but a moral problem. The ASA online store is one more sign of the managerialization of the ASA administration, which is now hopelessly divorced from the members and the profession, not to mention our scholarship. Maybe we are all paying a price for having let these matters once get out of our hands. But we can do more now than just sit idly by. A little theory. In Suicide, in the preface to the second edition of The Division of Labor in Society, and in the posthumously published Professional Ethics and Civic Morals, Emile Durkheim made a strong case for the professional group or corporation as potentially providing the moral authority that is needed to curtail the normative problems characteristic of modern life. Durkheim reckoned that the professional group might supply the necessary regulative force that is needed in a world where one’s profession has increasingly gained in importance, especially in the context of an unbridled market that is of more than a local character. Durkheim realized that the existing corporations did not fulfill this role and that they would have to be reformed to move beyond the sheer utilitarian functions of the ancient order of the guild in order to become a moral force that can impress itself upon the economy rather than merely be its servant. Question: Is the ASA a guild? I invite Section members to offer their thoughts on these matters — or to inform the ASA executive office, should they so desire.